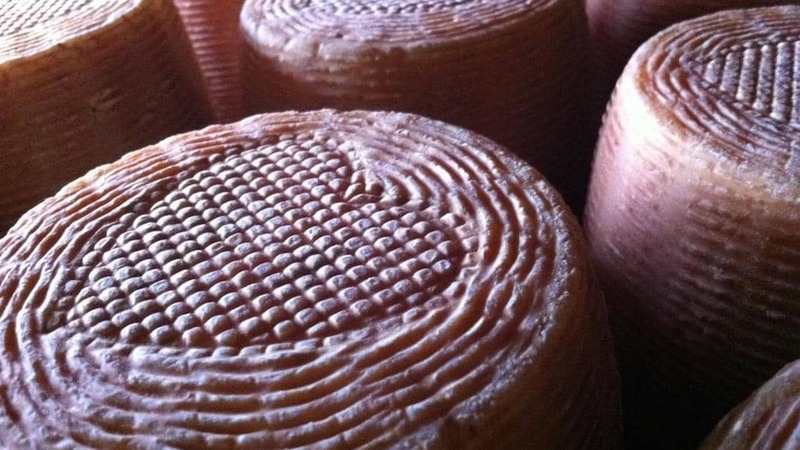 Bleating Heart Cheese | Making seriously good cheeses without taking ourselves too seriously. Handcrafted with whimsy in California. A little golden cheese, "Goldette Tommette" is a 1.5 lb semi-firm wheel with a lightly washed rind. Made from rich raw jersey milk, at 2 to 3 months of age the cheese has a firm but creamy mouth feel, pleasing aroma & a nice buttery tang. We think of her as the slim blonde cousin of our "Fat Bottom Girl" sheep cheese. 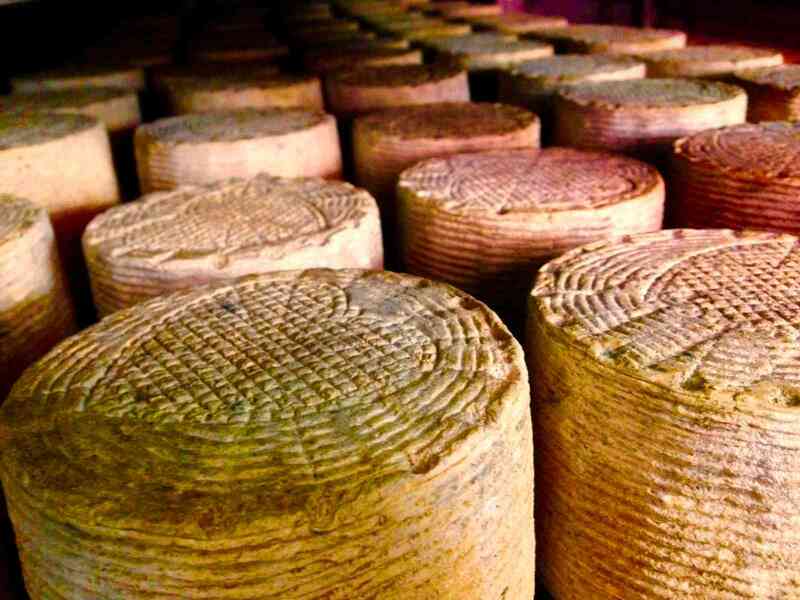 The name is inspired by the paste's golden hue - thanks to the jersey cow milk - and suggests a touch of sass, which is present from the subtly funky microbes that grow on the rind. We like a cheese with curves. Created in 2009 with absolutely no test batches, this is our flagship cheese, whose name was inspired by a Queen song and the cheese's accidental rotund shape. Fat Bottom Girl is approachable and appealing to both cheese geeks & novices alike. The cheese has a firm ivory paste with a toothsome bite and a touch of salt, conveying the subtle nutty & buttery goodness of sheep milk.. It was Benjamin Franklin who uttered the infamous quote "in this world nothing can be said to be certain, except death and taxes." While that may still hold true, we figure that in this world some things are certain to make you happy.... beer and cheese! Made from fresh organic jersey cow milk, the rinds on this cheese are regularly washed with Moonlight Brewing's "Death & Taxes" black lager - a cult favorite beer that pretty much every beer enthusiast in the Bay Area (and beyond) knows and loves. A little golden cheese, "Goldette Tommette" is a 1.5 lb semi-firm wheel with a lightly washed rind. Made from rich raw jersey cow milk, at 2 to 3 months of age the cheese has a firm but creamy mouth feel, pleasing aroma & a nice buttery tang. As it ages longer, the flavor instensifies. We think of her as the slim blonde cousin of our "Fat Bottom Girl" sheep cheese. 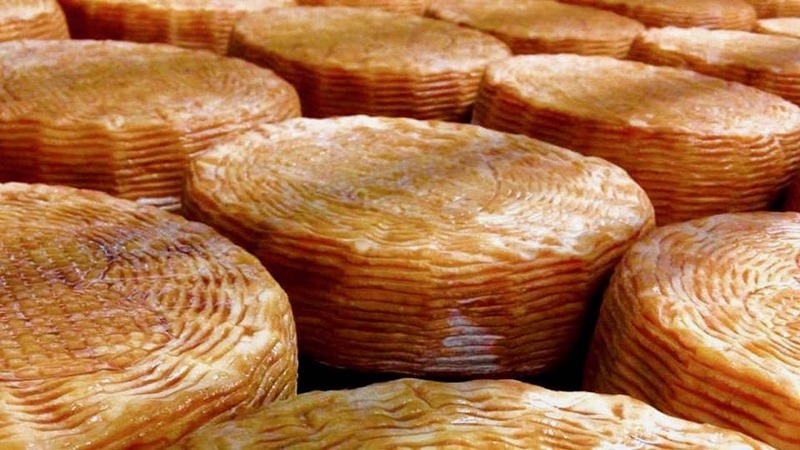 The name is inspired by the paste's golden hue - thanks to the jersey cow milk - and suggests a touch of sass, which is present from the subtly funky microbes that grow on the rind. Our newest creation, "Death & Taxes," is a super tasty collaboration with Moonlight Brewing Company. Fresh organic jersey cow milk is pasteurized, cultured, and coagulated with natural calf rennet. The resulting cheese curds are cut, stirred, and then scooped into basket forms by hand. After brining the next day, the cheeses are regularly flipped and washed with Moonlight Brewing's "Death & Taxes" black lager. We like a cheese with curves. Created in 2009 with absolutely no test batches, this is our flagship cheese, whose name was inspired by a Queen song and the cheese's accidental rotund shape. Fat Bottom Girl is approachable and appealing to both cheese geeks & novices alike. The cheese has a firm ivory paste with a toothsome bite and a touch of salt, conveying the subtle nutty & buttery goodness of sheep milk. Fat Bottom Girl is amazingly addictive when paired with pepper jams. Enjoy this cheese with a light fruity California red such as petit syrah & pinot noir, or light farmhouse-style ales such as biere de garde & saison or a nice lager. This cheese is quite delicious with Moonlight Brewery's Death & Taxes black lager. Better yet, come up with your own fantastic pairing and let us know about it! We encourage everyone to always keep an open mind and palate. Silva Family Dairy supplies us with 100% of our organic jersey cow milk. Bleating Heart's creamery is located in the same building as the dairy, so the milk only travels about 20 feet before reaching our cheese vat. The dairy was known as Marshall Home Ranch & Dairy when it first launched, and in 2014-2015 also supplied us with sheep milk. The union of the couple behind this rapidly growing dairy was born from a mutual love of the land, dairying, and each other.